Anyone who learning a computer first he learns the Microsoft Office ! Because everyday Microsoft Office is useful for doing small or big work at Office or at Home or at College for Presentation’s ,Spreadsheets ,creation of Documents , Charts & much more ! Microsoft every times adds new interesting features in their Products . Their are many versions of Microsoft Office comes in Market randomly like Ms Office 2003/2007/2010 & now Microsoft Office 2013 is latest product of Microsoft .This time Microsoft Launch the Office 2013 with interesting features for Their Windows 8 Operating System ! As we said Microsoft making their products Windows 8 friendly the new Microsoft Office 2013 main feature is Touch Screen ! Windows 8 is the operating system which mainly designed for Touch interface .The MS Office 2013 is easily handled on Touch interfaces .You can easily make changes in document or presentation by using for fingers .Just tap any feature & you can easily operate that feature .You can Zoom Any slide or document by using fingers .You can use stylus for wring text on document/presentation/spreadsheets. You can use stylus as Laser Pointer at time of Presentation !It is very easy handling in touch screen ! The Microsoft Office 2013 is more cloudy than Ms 2010 . In MS Office 2013 the SkyDrive is added i.e. Save Your work on cloud . It is very useful because If you save your document/presentation/spreadsheet on cloud you can easily handle it from anywhere . MS Office 2013 provides the upload button which saves your document at cloud then their is also option to share with others i.e. you can work on that document with others ! You can use that document on any device ! 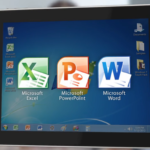 In MS Office 2013 Power Point is Also with new good features . In mS Power Point Presenter View that privately shows your current and upcoming slides, presentation time, and speaker notes in a single glance. While presenting, one can zoom, mark up and navigate slides with touch and stylus. HD video with presentations . MS Office 2013 allows you taking notes & store that Notes on cloud & handle that notes from anywhere,anytime & with any device .Notes can taken digitally i.e. keyboard,touch or pen easily . Yes the new MS Office 2013 is integrated with Skype & gives 60 international Skype Minutes Every month ! It integrates all contacts & you can call or message them & stay connected with them . 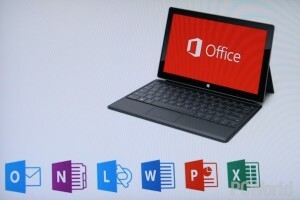 So Get the new Microsoft Office 2013 & experience new Touch world !